Will take the light with them. Overcast darkness of heavy clouds overhead. To acceptance of what must be. Does not allow me to let go of hope altogether. I can only imagine what those who are close must be feeling. Did I do enough when I could? Which I am not doing? It seeks peace only in meditation. Find inner peace in the midst of the turmoil. Life and death are, and will be, eternal mysteries. Eroding myself in the effort. 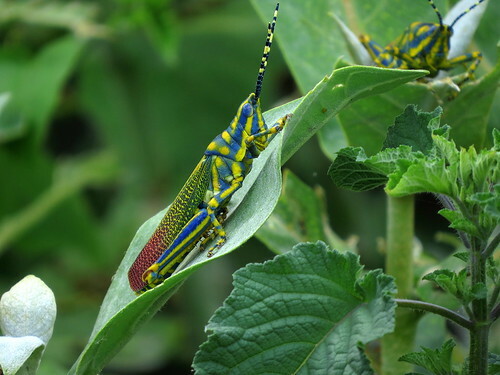 The wiki entry on this gorgeous-looking creature says that the grasshopper feeds on the poisonous plant Calotropis gigantea. 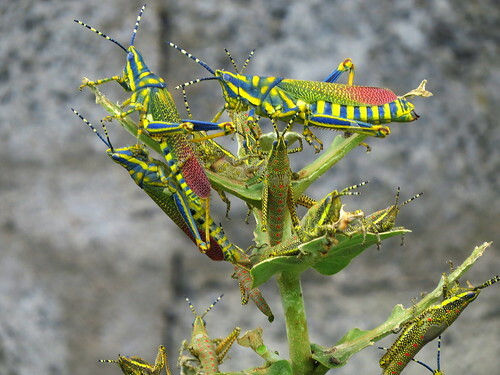 Certainly, these grasshoppers had stripped all the Calatropis (milkweed) plants nearby. 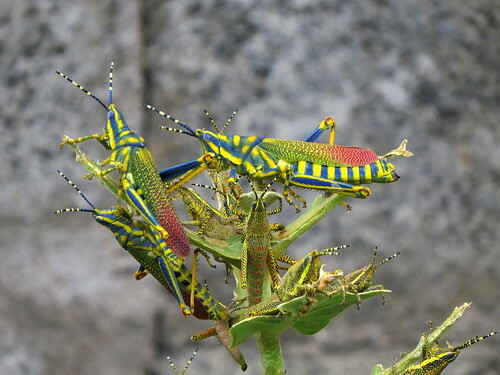 The wiki also mentions the interesting fact that these grasshoppers, when squeezed or handled, upon slight pinching of the head or abdomen, the half-grown immature form ejects liquid in a sharp and sudden jet, with a range of two inches or more, from a dorsal opening between the first and second abdominal segments. The discharge is directed towards the pinched area and may be repeated several times. The liquid is pale and milky, slightly viscous and bad-tasting,containing cardiac glycosides that the insect obtains from the plant it feeds upon. 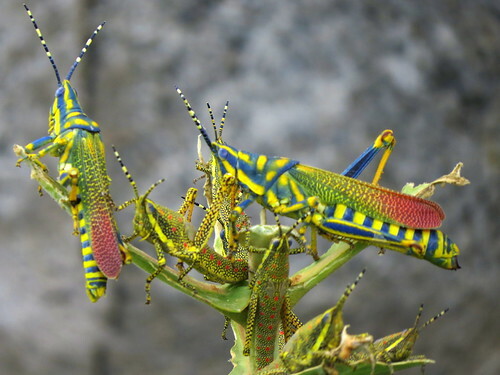 Grasshoppers can eat their way rapidly through vegetation, being a veritable plague of locusts. They are plant-eaters, sometimes becoming serious pests of cereals, vegetables and pasture, especially when they swarm in their millions as locusts and destroy crops over wide areas. 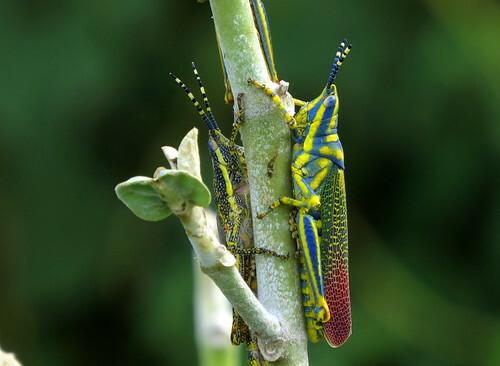 Most grasshoppers are polyphagous, eating vegetation from multiple plant sources,but some are omnivorous and also eat animal tissue and animal faeces. In general their preference is for grasses, including many cereals grown as crops. Grasshoppers seem extraordinarily sensitive to their environment through many of their sense. On the side of the head are a pair of large compound eyes which give a broad field of vision and can detect movement, shape, colour and distance. There are also three simple eyes (ocelli) on the forehead which can detect light intensity, a pair of antennae containing olfactory (smell) and touch receptors, and mouthparts containing gustatory (taste) receptors. At the front end of the abdomen there is a pair of tympanal organs for sound reception. There are numerous fine hairs covering the whole body that act as mechanoreceptors (touch and wind sensors), and these are most dense on the antennae, the palps (part of the mouth), and on the cerci at the tip of the abdomen.There are special receptors (campaniform sensillae) embedded in the cuticle of the legs that sense pressure, too. A large grasshopper such as a locust can jump about a metre (twenty body lengths) without using its wings! 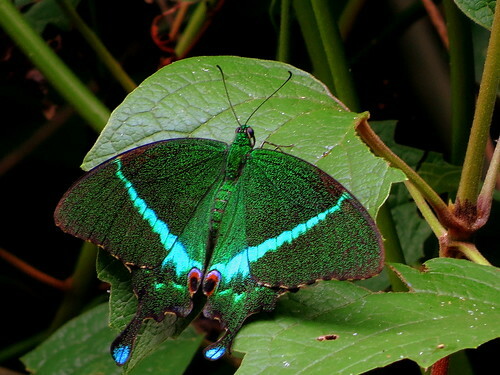 What a fascinating creature this is, and it was sheer chance that led me to this sighting…thank you, Mani! as we stopped to bird en route. It was one of the many marvellous things that met my eye on the long (500 km) journey, back to the hairpin bends that elevated us to the heights of Valparai! 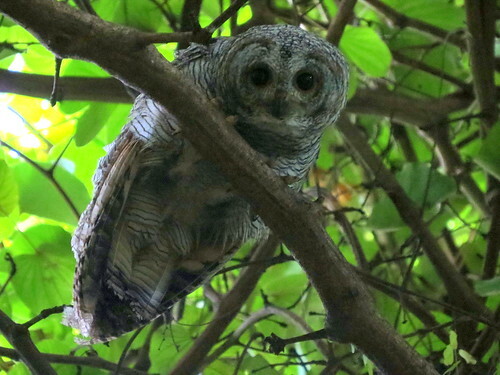 So, after a couple of reports that the Owls could not be found, one of them delighted me in its usual copse behind the giant Bauhinia creeper. The sexes are alike, according to the Wiki entry, so I don’t know if this is a he or a she! I took a short video as it hopped across, out of sight in the very low light. The music is “Night Vision” which is what I needed to see the Owl in the low light…and the band playing it is Bird Creek, which, too, I thought appropriate! Click on the name of the bird to find out more about this beautiful creature that shares one of Bangalore’s lung spaces with us! 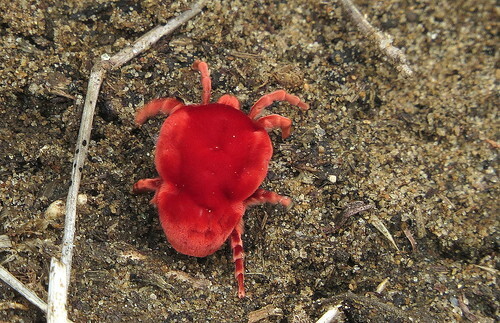 Red Velvet Mites or Rain Bugs are arachnids found in soil litter known for their bright red colours but are often mistaken for spiders. They are about 2 cm. across, in size, when fully grown. They usually have only one breeding cycle per year…so seeing them is not a very common occurrence. 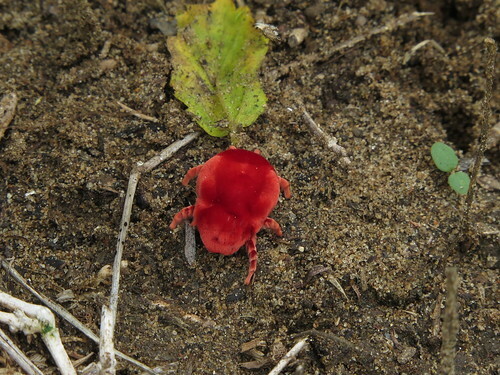 is the Oatmeal’s take on this fascinating creature and its mating habits! 3. My watch is stuck between 2 and 2.30. It’s a do or dhai situation. 6. A well executed theft in which there are no finger prints left is a stainless steal. 7. Sita after seeing Hanuman in Lanka for the first time. 8. Friends pay restaurant bills on a de-tu-de basis. 9. ‘I laughed yesterday’ in Hindi is ‘Michael Hussey’. 10. They don’t facepalm in Indian villages. They Sarpanch. 12. Rahul Dravid’s wristwatch is technically a wall clock. 14. Toll Booths are nothing but Bill Gates. You are currently browsing the Deponti to the world blog archives for August, 2016.